Succulents and cacti are all the rage and one of the most popular decorating trends today. You find mostly smaller versions used in almost every type of settings, from elaborate weddings to everyday surroundings. I love the simplicity of these plants and wanted something larger and impactful to display. So being the crafter that I am, decided to make my own faux prickly pear cactus arrangement. 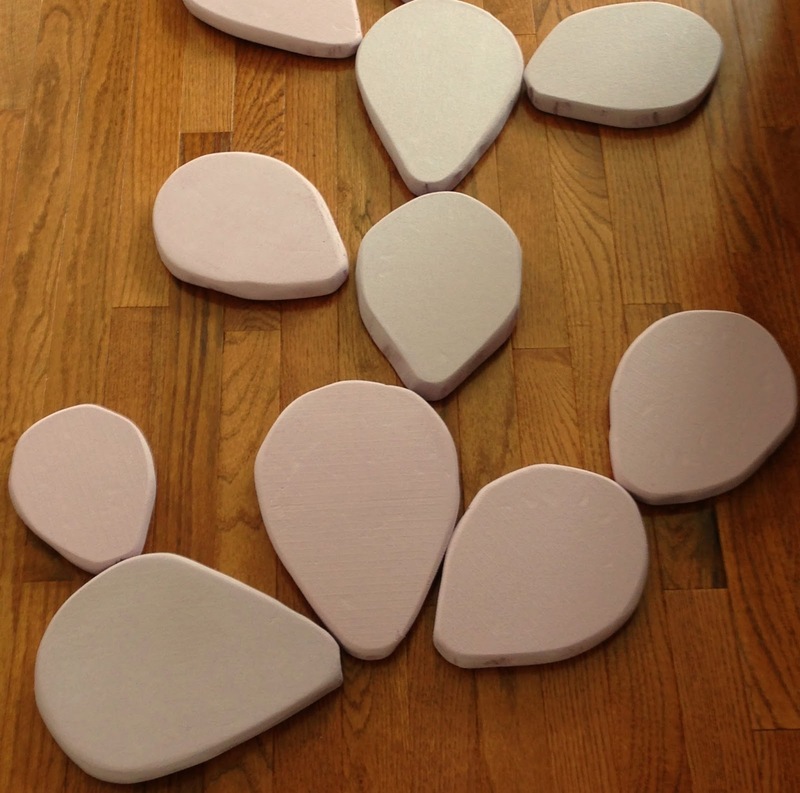 First, create freehand patterns for the cactus pads/fruit, and trace onto foam boards. 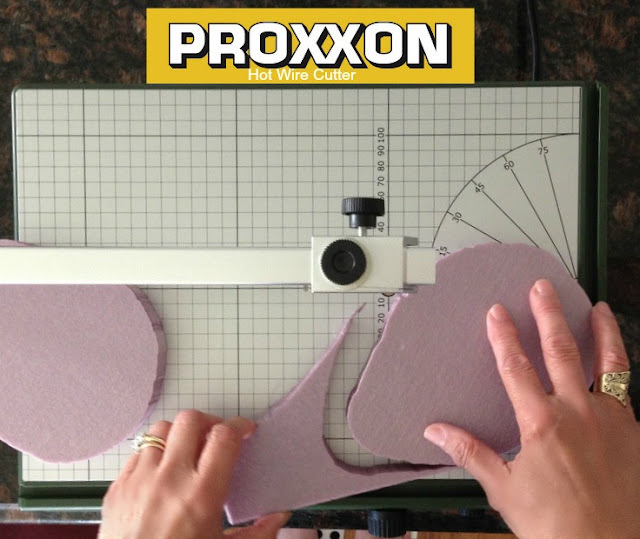 Cutting out the foam pads and fruit was so easy using my Proxxon Hot Wire Cutter. But you can also use a foam cutter, electric knife, small saw - anything handy that will cut foam! 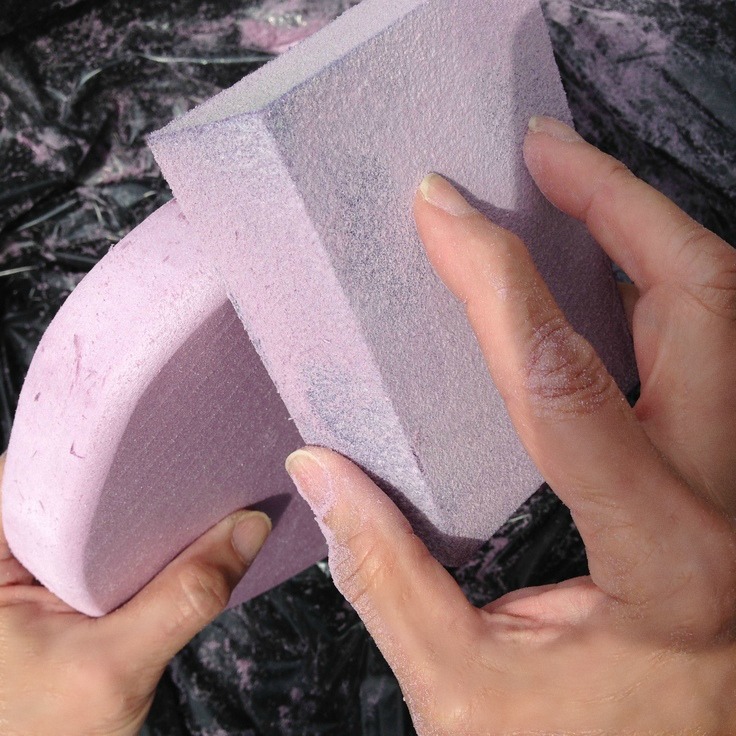 Next, smooth out and round off the edges and sides of the foam pieces using a sanding block. It really didn't take long to sand these! Next, paint all of the pieces. Use a variety of green colors to blend. To mimic the areoles of cactus, place random dots all over the pads with a marker. Next, remove bristles from a brush and then add a dab of hot glue over the dots. Wait a few seconds for the glue to set up and then insert the bristles into the hot glue randomly to represent the spines. and then, once completely dry, cut down the bristles for a uniform overall look. Place leftover pieces of foam into the bottom of a display container and cover with dried moss and or mulch. Randomly arrange the pads into a cactus plant in the container, connecting each one with toothpicks and hot glue. For the flowers, cut petal shapes out of foam sheets and paint both sides. Let dry. Imagine how a cactus flower looks. Place petals on a hot griddle for a few seconds, remove and shape with fingers. Glue shaped petals around a foam painted circle, clockwise, to form flower, leaving center clear. To form center stamens, cut a one inch strip from foam sheet . . .
and cut thin strips three quarters the width the entire length. Lay on top of griddle until ends curl and then coil the piece, gluing end to secure. Fluff and . . .
hot glue in center of flower. And finally, insert toothpicks to connect and randomly glue on fruit and flowers. Ta Da! What an attention grabbing design! That is so cool, Gail! Love the size and impact it makes! Aww this is so adorable. You create such pretty things from nothing. You are amazing! How cute is this! Gail, This is so creative and clever, right down to use those brush bristles! Amazing project. Pinned to share! Thanks so much for linking up and sharing with us this week at Snickerdoodle Sunday! Love seeing your creations! This is an amazing project. Love the Proxxon Hot Wire cutter. It's so hard to choose a favorite of your projects because they're all so amazing, but this one seriously takes the cakes. So amazing, Gail!!! I am beginning to think there is nothing you can't do when it comes to crafts, Gail! That prickly pear is awesome...you are such a talented lady. What a creative project. I love how easy you make this project look. Thanks for sharing at Dishing it & Digging it link party. We love having you and have a great week. This is awesome! Thanks for sharing at You're Gonna Love it! Finally a cactus I can't kill! If you’re trying to figure out how to get over a hangover you should try out Detoxicated. I use it every time I drink. They’re filled with anti-oxidants, vitamins, natural ingredients that help your body process alcohol by-products that can cause hangovers. I wake up the next day feeling rested and refreshed.